I’m excited to announced that first commercially published short fiction is now out on the newsstand, inside issue 405 of Starburst – the world’s longest running magazine of cult media. “On a Cold Martian Night” is a sharp little story of the dangers of future colonisation, especially the danger humans bring along with them. Thanks to Rylan Cavell for his moody artwork. One of the magazine’s requirements is that submitted stories be no more than 2000 words, and it was quite a challenge to hone my original draft of 3000+ words! However I think the painful editing process created a much stronger piece. If you do read it I’d love to know what you think? Also in this issue is coverage of The Walking Dead, an interview with George R R Martin, a look at Seventies grindhouse cinema, and plenty more about what is going on in the worlds of cinema, books, television and games. 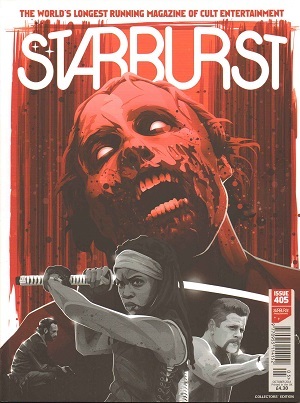 Starburst #405 is available online from http://www.starburstmagazine.com , and also W H Smith, newsagents and specialist SF shops like Forbidden Planet.